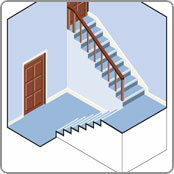 One of the most important aspects of stairlift installation is the rail. 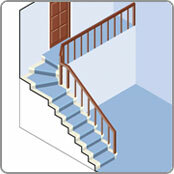 Your staircase will need either a straight or a curved rail to install your stairlift. At Florida Stairlifts Inc, one of our consultants will come and visit you to give your staircase a comprehensive survey and assess which type of rail is suitable. Although our stairlifts have been designed to work with most staircases, there are some occasions where installation of a stairlift will not be possible. If this is the case we will not sell you one – your safety comes before our sales figures. We will however suggest alternative solutions even if we cannot supply them. Whether you have straight or curved stairs, our rails are attached to the stair treads, not the wall, and can be fitted to either side of the stairwell – depending on the results of the survey. Choosing the correct stairlift solution will ensure that you can safely use the stairlift or lifts for years to come and maximize the space available for other staircase users. 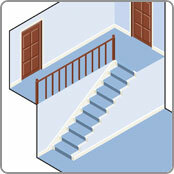 We have included some different examples of staircases below to help determine what type of staircase your home has. Straight stairlift or custom curving stairlifts depending on the users specific requirements. 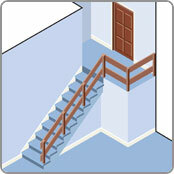 Images 1 and 2 depict straight staircases. Our straight rail stair lifts are made from aluminum extrusion tracks and come in various finishes. 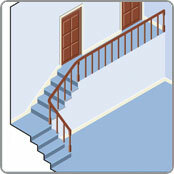 Image 3 shows a curved staircase with a quarter landing. This situation would suit two straight stairlifts on the left side of the staircase when looking upstairs or one curving stairlift on either side of the stairs. 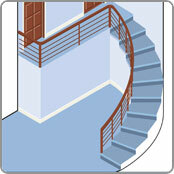 Image 4 shows a curved staircase with a half landing. This situation would suit two straight stairlifts on the right side of the staircase when looking upstairs or one curving stairlift on either side of the stairs. 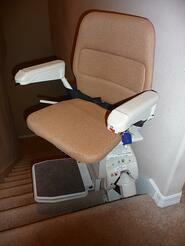 Usually two straight stairlifts is less expensive than a true custom curving rail stairlift. It is vital that the intended users are capable now and for the foreseable future to negotiate transfering from one straight stairlift to the other if the two straight stairlift solution is selected. The final two images depict staircases that would definitely require a custom curved rail. Image 5 shows a spiral staircase. The only safe solution for this staircase is the installation of a custom curving stairlift installed on either side of the stairs. If in doubt call us at Florida Stairlifts Inc your trusted “stairlift experts” to advise on your specific options and best stairlift solution. We offer FREE staircase surveys and quotes.